We, actually I mean Brad, has been working hard behind the scenes again to change my website shopping cart over to a new and much more flexible shopping cart. ‘So what?’ you may ask. 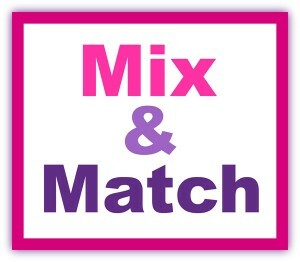 Well, I’m super excited to announce that we can now offer Mix & Match Bundles where you can Mix & Match your own special combination of patterns and save $$$$$’s! Yes, simply purchase any FIVE or more patterns from either my 18 Inch American Girl or 18 ½ inch Cabbage Patch Kids doll clothes patterns range and get 20% off. Yes, you get to choose which five and what size! So go ahead and start adding your favorite patterns to your shopping cart now. Once you reach 5 or more patterns your total will automatically be reduced by 20%. Hi Rosie. This is a great innovation for your site. I don’t need anything just now but will be sure to take advantage of it in the future.